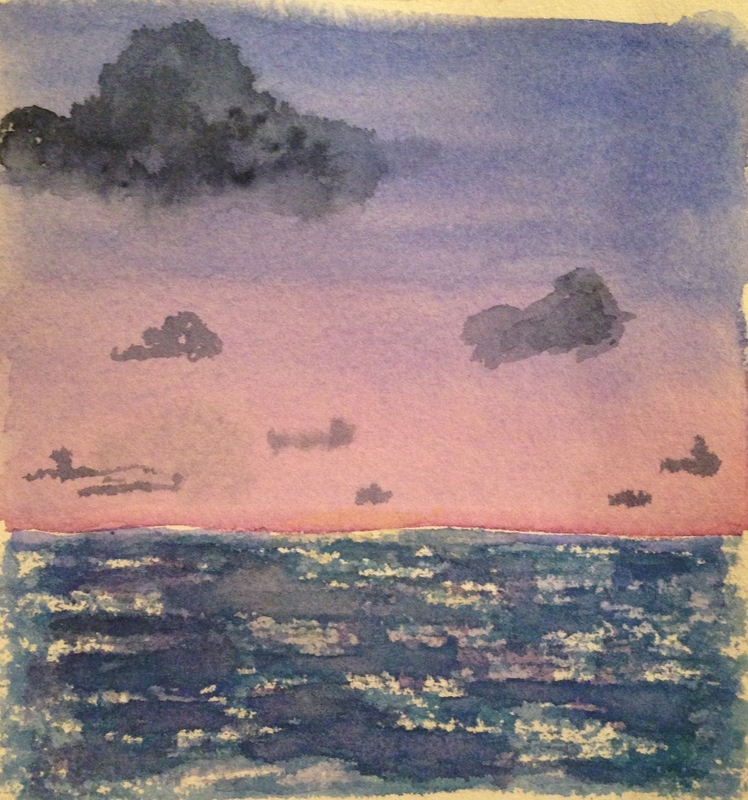 Trying to work on my skies in watercolor. And beach scenes. This is the kind of thing I want to be painting. Anything at all to do with the beach, water, skies….especially at this time of year, it’s pretty much the only thing I think about when I sit down to create art. This is about 4×4″, and stars cobalt blue, quin rose, azo yellow, and a bit of ultramarine blue and indigo. Touch of viridian green as well. Didn’t have much time last night; this was rushed to presses! Might have more time this weekend (I hope). Speaking of which, the weekend is so close, I can smell it! Happy Thursday! Peace. Hi Inari – you mean on Gollum? I got a comment that says “nice, cuty and scary” from a user called mysiteexists that was posted twice but looked like spam? I assume that’s no one I know. WP sometimes takes its phaser gun to my comments, too! I’ll look again, but I don’t remember any comment from you on that one. Ah nooooo, I posted early on and then reposted it again as it didn’t show, maybe spam? (not me on the account mysiteexists) If not give me a shout and I’ll post it again. Didn’t want you thinking I’m ignoring you… silly wordpress and pc. Nope, didn’t see it, Inari. I didn’t think you were the odd comment, but coincidentally that one was posted twice and didn’t appear because I left it in moderation. WP is goofy, no doubt. Haha, ok. I respond to every comment, so you’ll know if I saw it. I may need to check the spam section, I guess. On the PC (which I’m not on at the moment lol). I can smell that ocean too! Lovely. I have heard that Thursday is the new Friday. Sounds good. I was going to tell you, so I’m glad you asked. Yeah, it’s just a dry brush technique, holding the brush parallel to the paper. Very easy to do. Would be a lot more white spaces if I didn’t go over it with different colors. Thanks, Ann, glad you like it! Yes, please! :)). Do you hope to hear something soon? Makes me want to sit with my toes in the sand and my eyes closed, listening to the waves. Oh I do love this scene. I want to be in it. It speaks “dusk” to me for some reason and makes me feel very peaceful. It just “dawned” on me how much you love skies – your WordPress Cover Photo is a sky! Are you going to get to the beach this summer? I’m glad you enjoy it, Jodi. Thanks! We usually go in October but not sure if we’ll make it this year. Had to replace the furnace a few months back and lots of other things need attention….and an older cat I’m not keen to leave for a couple weeks (when we go to NC, we like to stay awhile)….we’ll see. We may take some time and go back to the Skyline Drive area. I’ll be painting them all, as my skills permit. I’ve been taking lots of photos for years of wherever we land! :))) How about you? I know how that is! I’m excited to be going next month with some of my GFC (Girlfriend Camp) girlfiends for a girl’s week at the beach. Look out NC! GFC is coming! The best gifts come in small packages…thank you for this lovely ocean scene, I can feel the cool breeze now. Have a wonderful weekend. Summer and the beach go hand-in-hand. 🙂 Beautiful shimmery waves! it’s so great that you have the devotion you have to keep pursuing this challenging medium….and it’s obvious you are achieving mood-creating results….and here’s hoping your weekend is full of beautiful dusks and maybe even pounding surf! Thanks, Jo! I miss you and the records. I hope you’re well. I am really liking these scenes. Fantastic! I would love to see some In-progress pics too! ;) because ur work is beautiful……. Thanks, Debi. I have a ways to go with watercolor, for sure. I need a lot more freedom in my watercolors, I think, for them to really sing. This is really beautiful! I’m totally jealous of your skills at rendering the ocean and making it look alive. Just the thought of attempting it terrifies me. Thank you, but it is only drybrush, and that’s it. Takes two seconds (unless you’re like me and keep going over it with different colors). Hold the brush parallel to the paper and lightly brush the damp brush where you’d like the water. Seriously, no skill involved. That still sounds pretty complicated to me. Maybe I’ll work up the nerve to give it a shot sometime though. I hope you do – you’ll see how easy it is. I agree with you, painting water for some reason scares me, but that technique makes that kind of sparkly water easy. Alright, you’ve talked me into it. Next time my random image generator comes up with a beautiful ocean shot I’ll actually give it a shot at it instead of sighing wistfully and then cringing away in terror. I’m still not convinced that I’ll be able to pull off anything remotely resembling water but I’ll give it a shot at least.